I recently spent a glorious week eating my face off in Italy, and one of the stops included the picturesque small town of Bormio, nestled smack dab in the middle of the Alps. It’s tough to complain about panoramic views of some of the world’s most stunning mountains but I’d say the only thing that could’ve made my experience better was if I enjoyed such views from the comforts of a pine cone-shaped treehouse. I mean, wouldn’t any experience be amplified when you add a pine cone-shaped treehouse to the mix? 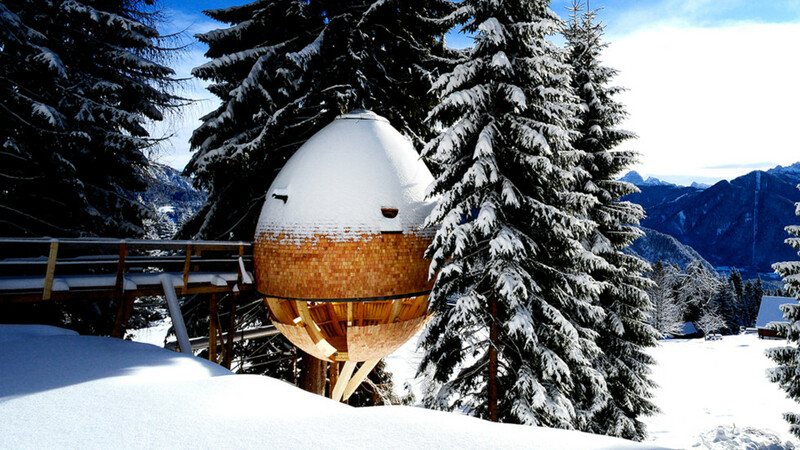 Maybe on my return trip to the Alps, I’ll have the good sense to hole up in Pigna, a pod-like, sustainable structure in the forests of Ugovizza, Malborghetto Valbruna, a municipality that hugs the border of Austria. Claudio Beltrame and his team at Architetto Beltrame Claudio first devised the project for an architectural competition in 2014 and recently built it for real. The result is one of the coolest rentals you’ll find in Europe — or hell, anywhere. According to Beltrame and co., Pigna sits in the “oldest and widest” forest of Italy, where the rare spruce trees are used to craft violins and other wooden instruments. The architects also used this wood to build the two treehouses that make up Pigna, one of which serves as a 4-meter high terrace with breathtaking views. The other features twisty stairs that act as the pine cone’s “structural cage,” per the description. This second treehouse, which includes two large windows with sliding doors and a round skylight that covers the upstairs bedroom, feels rustic and cozy while maintaining modernness. It’s available for 250 euro (around $300) a night on Ecobnb, and if you somehow need any more convincing to book your stay stat, check out the rest of the home on Arch Daily.